Fresh strawberries, fluffy cake and whipped cream is always a magical combination in the summer; there’s nothing quite like strawberry shortcake. Since we are huge fans of this dessert, we wanted to create a healthier version of the recipe that is not only grain free and gluten free, but sugar free as well. 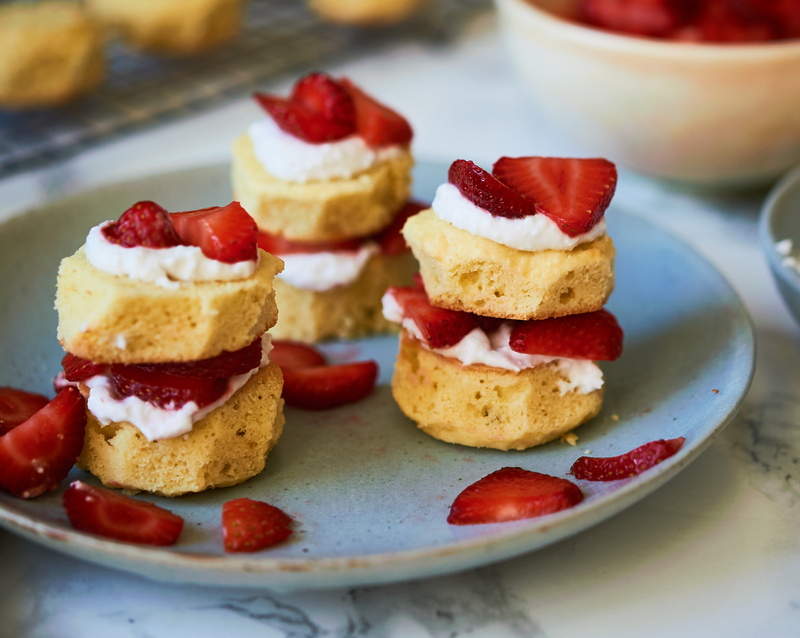 This strawberry shortcake contains healthy fat and protein that will keep your blood sugar stable and is even nutritious enough to eat for breakfast (why not, when it’s possible, have dessert for breakfast). We use almond flour, coconut flour and tapioca flour instead of white flour in this recipe and coconut milk instead of dairy for the whipped cream. We’ve been wanting to try out using monk fruit sweetener in place of sugar (and even in place of natural sweeteners like maple syrup and coconut sugar) in order to create a truly sugar free recipe. And, you won’t even know the different when you taste this recipe, the monk fruit sweetener works perfectly! 1. Preheat oven to 375. Mix together the dry ingredients for the shortbread. 2. Use a food processor to pulse in the butter or coconut oil (or use a pastry cutter or butter knife) until you have a fine crumbly mixture that’s starting to stick together. 3. Add in the eggs and vanilla extract and mix all together to form a thick batter. 4. Oil a muffin tin well with butter or coconut oil. Scoop the batter evenly into the muffin tins (it won’t fill the tins very much). Make sure the batter is flat and spread out evenly. 6. Remove from the muffin tin and let cool for 15 minutes. 7. Meanwhile, prepare the strawberries by slicing them in thin pieces and mixing together with lemon juice in a bowl. 8. For the whipped coconut cream: Carefully scoop the fatty cream part of the coconut milk off of the surface (you don’t want the liquid part, you can save that for smoothies!). 9. Whip the coconut cream with a mixer or you can pulse in the food processor a few times instead if you don’t have a mixer. If you want to sweeten it, add in the monk fruit sweetener while whipping. 10. For the shortbread: Once it is cooled, carefully slice off the edges that have browned so that you can see the inside of the fluffy cake. Note, this part is optional, you can definitely eat the lightly browned edges if you want to skip this step. Slice off the puffy top of the shortbread, so that it is flat. 11. Scoop a dollop of coconut cream on top of 6 of the shortbreads. Scoop some strawberries over top. Then place another shortbread on top, to form 6 mini layered cakes. Top these with coconut cream and more strawberries.